DODGE CITY, KS - The longer I've been storm chasing (2016 was my 24th season), the higher the bar gets for an event to rank in my top ten. So, it's saying something that May 24, 2016 is my new #1. This storm produced the bulk of every type of tornado scene I've ever wanted to capture: Several "lifetime" tornado scenes - simply perfect in structure, lighting and foreground. I will always be in humbled disbelief I was blessed to be there and witness such a rare and stunning display of nature. It's going to be hard to top. In fact, if I had to choose between the legendary Campo tornado day and this one, I'd pick Dodge City every time. I counted (from my video and stills) at least 11 separate tornadoes. Others say there were more, possibly as many as 15-18 (which very well may be true, when you're closer, you tend to miss some of the action in other parts of the storm). My better chasing years (2004, 2005 and 2007 for instance) have netted me a total of 12-14 tornadoes all season. Seeing 11 or more in a single day is off the charts! I had stayed in Sayre, Oklahoma the previous night, so I had a pleasant leisurely trip to the day's most obvious target only 3 hours' drive to the north. An outflow boundary from previous day's storms was oriented from western Kansas down into northwestern Oklahoma, just east of the dryline and in the midst of a very unstable and sheared environment. Any storm that fired on the dryline and interacted with this boundary would have excellent tornado potential. I stopped among several chaser groups at the Shattuck Windmill Museum, a classic landmark in the realm of storm chasing. After buying a Windmill Museum t-shirt, I made my way north, stopping at a large roadside pull-off at Rosston, Oklahoma as the largest and best pre-storm chaser convergence I've been a part of got going. Chaser convergence isn't really a bad thing! This was like Chasercon - getting to see and talk to fellow colleagues you only see in passing maybe once a year. In the 4-way view timelapse video from the day, this starts at 5:30. I had a great time here, just another perk of this amazing day. As we milled about meeting, greeting and conversing, someone made the announcement that a supercell way up near Scott City, Kansas had already produced a tornado. That was the cue for us to start wrapping up our roadside mini-convention and move north to our incipient storm, where some agitated cumulus was looking ready to break through. One by one, we loaded up and took off northbound. As I approached the storm at Minneola, the first scud tags of a wall cloud began to develop. I kept going, pulling right up under this area with only a few minutes to spare before the first dust whirl began in the field a couple hundred feet to my west. I backed up slightly to give the newborn (and very weak at this point) tornado some room to cross the road in front of me, and the show was under way! 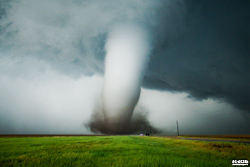 The tornado tracked northward generally right along the road, making for an easy chase as it went through several forms - morphing from narrow cone funnel with a thin tube to the ground, to a crazy snaking multiple-vortex "sidewinder", to full cone, then to a majestic stovepipe (and sometimes cone) with an expansive black debris cloud. At one point, a horizontal vortex was exhibited. After "Dodge City Classic I" roped and finally vanished, I made the short jog over to the new meso as it began producing "Rozel III or Dodge City Classic II". As "Dodge City Classic II" narrowed, a solid rope tornado planted to its east under a new circulation, another instance of simultaneous tornadoes. There was a third simultaneous tornado at this stage as well, though I did not see it (so I won't count it in my personal total for the day). At this stage, a new storm had developed to the south of the original and was beginning to affect the first storm's inflow. The appearance of the meso/wall cloud deteriorated as the new storm advanced over Dodge City, dropping tennis-ball hail on me as I moved south. My hail shields likely saved my windshield here. I thought the new storm might have tornado potential itself once it moved north, but it never did seem to organize. With the storms congealing into a large complex to the north and east, it appeared the tornado threat was diminishing, so I decided to end the chase and start heading back into the city for dinner.